You are currently browsing the category archive for the ‘in the news’ category. If you use a baby sling to help you parent, the Baby Carrier Industry Alliance (BCIA) needs your help. Much of the baby sling industry currently exists in a precarious regulatory limbo, which means that your favorite sling manufactures may soon go out of business. Please join the BCIA now to help ensure that babies and parents continue to reap the benefits of babywearing. The US Consumer Product Safety Commission has gone on record warning parents about the use of slings, which has damaged the industry’s reputation and market share. * Although the BCIA believes the statement was issued with the best of intentions, the statement is mistaken and seems to be based on the dangerous duffle bag-style carrier that is structurally dissimilar to a standard baby sling. Without a strong and united voice, the industry will continue to deteriorate and could conceivably be regulated out of existence. In the wake of the March 2010 warning, at least two major US manufacturers have ceased operations, and many more will be affected in the US and globally if we do not act. The BCIA is working with industry experts and legal advisors in forming a Position Paper (also called a White Paper) clarifying the essential nature and indisputable public health benefits of baby carriers. Additionally, the BCIA is working closely with government, manufacturers, and consumer groups through ASTM International in order to finalize, as soon as possible, a standard that is achievable to both small and large manufacturers. If you have a stake in the baby carrier industry, whether as a manufacturer, retailer, educator, consumer, or a citizen interested in the well-being of infants and families, please support the BCIA both by joining as a friend or business member and also by spreading the word about our organization and the good work we are doing. 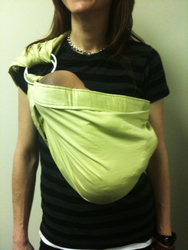 Click here to read the CPSC warning about slings. Sakura Bloom is a proud member of the Baby Carrier Industry Alliance. Sakura Bloom Graces The Cover Of Mothering Magazine! Wondering what sling the mom and baby on the July/August issue of Mothering Magazine are wearing? A Sakura Bloom! They are wearing our new Lime – Simple Silk sling! Woohoo! As is that weren’t cool enough, my sister Carole is quoted in the babywearing article. She is interviewed not as part of Sakura Bloom but as her alter ego, professor of anthropology at the University of Colorado. This issue will be a great resource for new parents and we’re thrilled to be a part of it! Together with 15 babywearing businesses, Sakura Bloom speaks out on Babywearing Safety via the Associated Press. Hotslings, Maya Wrap, Moby Wrap, Wrapsody, Gypsymama, Together Be, Kangaroo Korner, Taylormade Slings, Scootababy, Bellala Baby, Catbird Baby, SlingEZee, ZoloWear, HAVA, SlingRings and Sakura Bloom. Check out this fun little interview with Lynne on Fawn&Forest! Thanks to Summer! This was a lot of fun! We just love this Sakura Bloom collage that Joanna from LotusHaus Mama put together! She has the eye for all things beautiful and her sister blog, LotusHaus, is a great place to find amazing design inspiration. Pregnancy & Newborn lusts for Sakura Bloom. Check out our Verde Luxe baby sling featured in the latest issue of Pregnancy & Newborn! We are the “LUST” in their Lust VS. Must section. Our Verde sling: a brilliant, complex, and enchanting green interwoven with blue. Handcrafted from wild tussah silk. Wild tussah is an eco-friendly silk, made from the cocoons of wild silk moths after the moth emerges. Our specially sourced tussah is traditionally woven with hand dyed silk threads. The result is a sumptuous textile, strong but soft, and with beautiful prismatic hues. Entertainment Tonight features Sakura Bloom! Saturday March 8, 2008 – Sakura Bloom hits Hollywood! This past Saturday, Entertainment Tonight’s Thea Andrews showcased the hottest baby gear among celebrity parents. Our “famous Sakura Bloom sling” was highlighted as the latest way for celebrities—and other stylish parents–to carry their babies around Hollywood. Pia Lindstrom, owner of the popular Nomi Boutique in L.A., modeled our best-selling Licorice~Slate baby sling from our silk Essential Collection. Check it out on the video below!